Ανακομιδή λειψάνων Πρωτ. Στεφάνου. Τα λείψανα ανακαλύφθηκαν με θαυμαστό τρόπο στα Ιεροσόλυμα τον 30 αι. Μεταφέρθηκαν στην Κωνσταντινούπολη, όπου εναποτέθηκαν στο προάστιο που πήρε το όνομά του. Translation of the Relics of Stephan the Protomartyr. They were miraculously discovered and transferred to Constantinople to a suburb that was, consequently, named after the Saint. 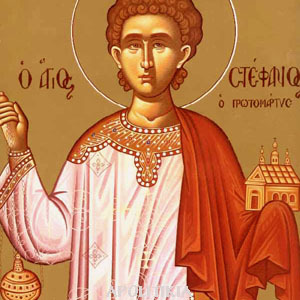 2nd August: Translation of the Relics of Stephen, the Protomartyr.The holy relics were miraculously discovered and transferred to Constantinople, to a suburb that was, consequently, named after the Saint.Apolytikion: Βασίλειον διάδημα, ἐστέφθη σὴ κορυφή, ἐξ ἄθλων ὧν ὑπέμεινας, ὑπὲρ Χριστοῦ τοῦ Θεοῦ, μαρτύρων Πρωτόαθλε, σὺ γὰρ τὴν Ἰουδαίων ἀπελέγξας μανίαν, εἶδές σου τὸν Σωτῆρα, τοῦ Πατρὸς δεξιόθεν. 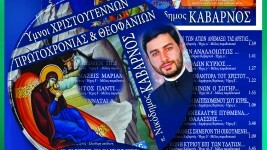 Αὐτόν οὖν ἐκδυσώπει ἀεί, ὑπὲρ τῶν ψυχῶν ἡμῶν. *St Stephen Still Makes Us Uncomfortable*The local Roman Catholic parish has services every single day this week, except for today. One the one hand, the priests understand that people are “massed out.” One or two masses a week is the limit even for the Roman Catholic faithful. And I have seen first-hand the boredom that cannot be hidden even with the abbreviated RC mass of only 40 minutes.But St Stephen is great. If the reality of the resurrection has dawned upon us, then we have as much reason to celebrate today as we did yesterday, in honour of the Nativity. In fact, every day. Christ is risen from the dead every day.But St Stephen still makes us uncomfortable. People don’t like the idea of dying, especially so soon after they have celebrated birth. Anyway, “Lighten up! A little stoning to death never hurt anybody.” But seriously, to paraphrase Pope Benedict, through Christ, we are made heirs to a heavenly birth. Happy St Stephens Day everyone, whether as celebrated in the West, today, or in the East, tomorrow.Αγίου ΣτεφάνουTroparion (Tone 4) [Holy Tradition]O First Martyr and Apostle Of Christ,Thou hadst fought the good fight.And didst expose the perversion of the persecutors,For when thou wast killed by stoning at the hands of wicked men,Thou didst receive a crown from the right hand on high,And didst cry out to God saying,”O Lord do not charge this sin against them!”Kontakion (Tone 3) [Holy Tradition]Yesterday the Master came to us as a man,And today his servant departs from life.Yesterday the King was born as a man,And today His servant is stoned to death.For the sake of Christ Holy Stephen became the first martyr. μπορεί να θέλουν να γνωρίζουν ποιος αγόρασε το σακάκι στο Κίεβο ..